The Zenica of Croatia’s Jadroplov (Adriatic Steamship) offered voyages to the Great Lakes since 1959, the year when the new Seaway was opened. 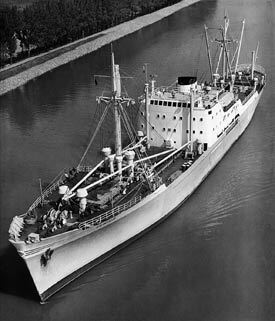 I began my seafaring career on this ship as a cadet in 1961. Westport, CT - On the eve of The Freighter Travel Club’s 50th anniversary we are reprinting some of the more interesting articles from the December 1958 charter issue of the Freighter Travel News. This will be followed by a full set of today’s Q&A Freighter Cruise Guidelines. Established and presided by Reg Clark for 20 years, followed by Lee Pledger for an additional 25, the club's purpose was to facilitate an exchange of information among its North American members. In these modern, Internet days, the club is run by Capt. Ranko Zunic, President and Ian Turner, Editor and has the broader mandate of being an international club that can also provide its members with the ability to easily book freighter voyages. This jointly operated service offers one of the best travel bargains we know of. Operating from Vancouver, BC to Hamburg and Bremen there are many ports of call enroute so that the full trip takes approximately 42 days at a cost of only $500 or $12 per day. At these rates you cannot afford to stay home. Embarkation ports are Vancouver, Seattle, Portland, San Francisco and Los Angeles, and you may book passage to Antwerp, Amsterdam, Rotterdam or first German port. From California the fare is $460.00. Both fares quoted are for accommodations in two berth cabins with private shower and toilet. Deck space is ample and public rooms include a smoking room and bar. Excellent German food is served. Sailings about every three weeks. With no language except English you can travel the world without too much difficulty, however you will encounter many people with whom you would like to establish some communication and who do not speak English. For this purpose we recommend that you take with you four small pocket dictionaries - French, German, Italian and Spanish. These cost about $1.25 each and are available at any stationary store. Your ship’s officers and stewards will undoubtedly speak English but there will probably be passengers who do not. With the aid of these dictionaries you can spend many interesting hours writing and deciphering notes to each other. Shall I take my car? A member of the Club is planning a five month tour of Europe and inquires about taking his car on the freighter. Of course he can take his car with him, however most people prefer to rent a car in Europe or buy one there on a guaranteed re-purchase plan. There are a number of reasons why we think it better not to take your car, not the least of which is the expense. From the Pacific Coast to Europe and return it will cost from $800 to $1,000. In addition gasoline costs in Europe are high and the smaller European cars will save many, many dollars in fuel costs alone. Further, with the exception of a few magnificent highways like the Autobahn in Germany, European roads are narrow and winding and American cars are simply too long and too wide for comfortable driving. One of our neighbors says he gets seasick in a rowboat so he is sure he wouldn’t enjoy a sea voyage. He couldn’t be more wrong. If you are subject to motion sickness you should take with you one of the new remedies and we feel sure you will have no serious discomfort. While we have seen some touches of seasickness recently it has been years since we have known anyone to be sick enough to miss a meal. Most of the time, and especially when the ship is loaded, the decks of a freighter are as steady as your living room floor. A man of 71 asks our opinion of the advisability of his booking passage to England by freighter. If you are in good health you should certainly take your trip. If you have a history of any serious disease, or if you think you might need medical attention, don’t take a freighter, take a passenger ship. There are some lines that will not take passengers over 70 and almost all require a medical certification of good health if you are over 65. This certification should be a letter from your own doctor on his letterhead. First aid is always available on shipboard and it is also well to remember that life on shipboard is healthier than on land. You will get more rest, there are no tensions and certainly there are fewer germs. 1) What do passenger freighters today consist of? 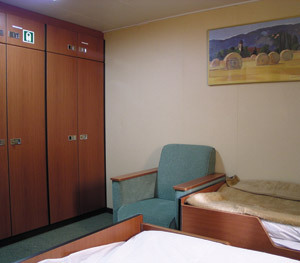 Two basic groups of working ships set aside cabins for passengers: freighters and mail/supply ships. Freighters, including containerships and general cargo ships, are one of the lifelines of the world economy, but of the oceangoing ships in the world, only about 1% carry both passengers and cargo. It's a special niche serving those travelers with the time and temperament to sail long itineraries - anywhere from a few weeks to several months - and who don't mind doing without the amenities of a modern cruise ship. Most of these ships are French and some German, all with international officers and crew onboard, offering accommodations for 2 to 12 passengers on roundtrip voyages, as well as longer one way voyages (between the continents only). Containerships carry shipping containers stacked like so many building blocks, and account for the bulk of oceangoing trade today. The average port time is one day. 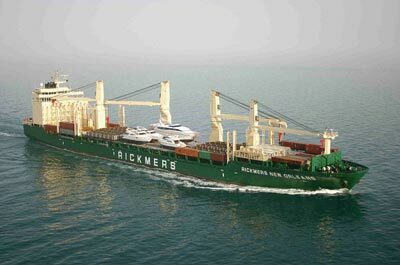 General cargo ships often transport large or unwieldy goods. Port time varies from one day to several days. Supply and mail ships run supply routes to isolated coastal communities and distant islands. Port time can vary from half a day to two days. 2 How large are freighters, and what cargo do they carry ...? 3 What flags do they fly ...? 4 ... and how safe are they and their voyages? 5 How many passengers do the freighters carry? 6 What will my fellow passengers be like? 7 How do passengers spend time on board? 8 What on board facilities and services can I expect? 9 Who are the officers and which language is spoken onboard? 10 What currency is used onboard? 11 Who should I tip? 12 Are there elevators onboard? 13 Do freighters have telephone, e-mail and Internet connections? 14 What is the electricity? 15 Do freighters have stabilizers? 16 What clothing should I bring and what is the dress code? 17 Why is the fare quoted in foreign currency? 18 Do I have to pay extra if the voyage takes longer? 19 How much luggage is allowed? 20 Can I bring my car and other personal belongings with me? 21 Can I bring my pet with me? 22 Is there an age limit? 23 What are the visa, medical and insurance requirements? 24 What services are available in port? 25 How long do the ships stay in port ...? 26 ... and how far from the town do they dock? 27 How do I know when the ship will arrive and where to board the vessel? 28 How do I make reservations? 29 Any other practical advice? 30 Can you recommend a book? 2) How large are freighters, and what cargo do they carry ...? Ocean going general cargo ships used to be between 3,000 and 15,000 tons. Today they are more likely to be 20,000 to 40,000 tons, while containerships are 20,000 to over 100,000 tons or, expressed in container capacity, from 2,000 to over 20,000 TEU (Twenty-foot Equivalent Units). Cargo ranges from A for automotive parts to Z for zucchini. In other words large engine parts, the furnishings of an entire home or temperature-sensitive chilled produce, all is carried nowadays under optimum logistical conditions to ensure that cargo reaches its destination safely and on schedule. 3) ... What flags do they fly ...? The majority of them fly flags of convenience, which is why in most cases the flag is not included in our data, but rather the nationality of the owners or managers, senior officers and crew members. While passenger service is usually offered by the shipowner, we also indicate if the ship is running its main cargo operation for someone else (charterer). 4) ... and how safe are they and their voyages? 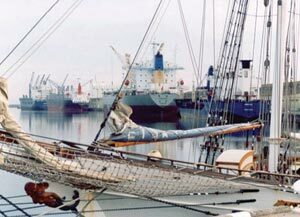 In addition to the care and control of its owners and flag state, every ship is supervised during its construction, as well as checked and tested for its seaworthiness throughout its life by one of the classification societies such as Lloyd Register (LR), American Bureau of Shipping (AB), Germanisher Lloyd (GL), Bureau Veritas (BV) or Norske Veritas (NV). Society initials appear on the hull of the ship as a part of the Plimsoll mark. The Plimsoll mark indicates the depth to which the ship can be safely loaded during various seasons and in various locales. And port authorities on every voyage ensure the ship's compliance with respect to the security of both passengers and cargo. On the subject of pirates, as has always been through the ages, there is still such activity in a few areas of the world. They generally do not affect larger and faster ships. The small expedition ships and mail and coastal ships which we feature on our pages are outside these areas. The International Maritime Organization, the United Nations’ specialized agency responsible for improving maritime safety, monitors, investigates and reports on piracy at www.imo.org. 5) How many passengers do the freighters carry? Usually up to twelve, however, in many cases no more than two or four. 6) What will my fellow passengers be like? They have spent quite enough time in crowds and they can take lengthy periods of time off. Now they make their choices based upon a wished for experience, rather than on factors such as the price of packages, glitzy entertainment, or extravagant amenities. They are often an affluent but unpretentious lot who relax on board in shorts and sandals, lie reading a book in a deck chair, hearing nothing but sea gulls and waves. Ashore, they visit places they have read about and dine quietly in the fresh-fish restaurants. 7) How do passengers spend time onboard? “It sounded a bit intimidating, but it was amazingly civilised. Informality and good fellowship was one of the perks, as was the freedom, and time, to unwind. It's not like when you're at home and have a lot of time. You're not mulling over your past. It's all about the voyage and the future and what you're going to do in next port”. The sea also mesmerizes me. For me there is something very natural and whole about being at sea. I am somehow in tune with the motion of the ship, even when we are in rolling waters. I sleep very deeply, almost as if I am in a cradle. There is an energy surrounding us in this great outdoors, and it is healing. I feel peaceful, healthy, safe, and joyful. Life is good”. Emmelene’s family is here en masse to greet her on the completion of her around-the-world voyage. She had been planning it for about seven years, so it’s a major milestone in her life. Everyone came onboard to see all the paintings that she had done. Two of those were portraits of one CIS and, after sharing them with her family, she presented one to the Swansons. This will be a Swanson keepsake for many moons to come and we thank Emmelene from the bottom of our hearts”. “One question to consider before you go is your own attitude and temperament. 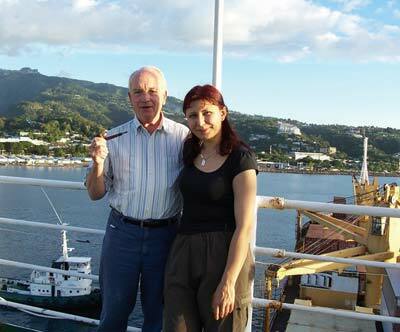 Lew and I owned a sailboat for years and we have crewed on sailboats in the Caribbean, the North Sea, and in Alaska. We get great pleasure out of sitting and watching the water go by. 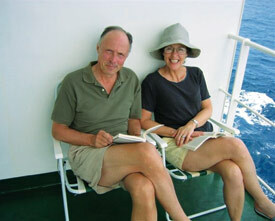 Once when we had decided we were too old to climb the rigging, we tried a conventional cruise. While it was very nice, dressing for dinner every night, eating sumptuous meals, watching a lavish show before the plentiful midnight buffet, etc., it did not really excite us. "I did quite a lot of needlework (made a quilt top) and Bill walked 210 km around the deck as part of his daily exercise during the voyage. We enjoyed numerous visits to the bridge and learned how to read the radar screen. We didn’t have to do any work, not even make our own beds! We did our own washing, though." 8) What on board facilities and services can I expect? Passenger cabins are located on upper decks and have the same facilities as officers’ cabins, including private baths and air conditioning. They are more spacious than cabins on the average cruise ship. 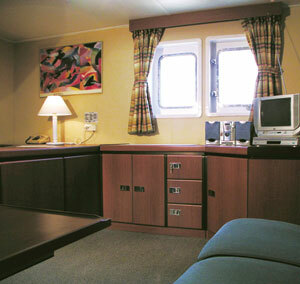 Some provide amenities such as a mini refrigerator, TV/DVD and stereo sets, and in house/ship telephone. 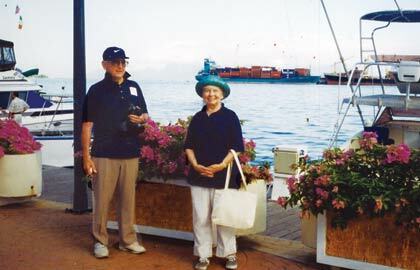 Front- and aft-facing cabins, may have their views obstructed by the containers stowed on deck. 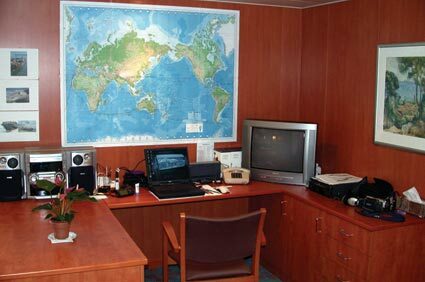 In general passengers and officers share the dining room, lounges with TV and small video and book libraries, as well as the exercise room and sauna, swimming pool and similar facilities found on most freighters. Deck space can be limited but there is always room for sunbathing and deck chairs are provided. “Our cabin had two rooms. The main room contained a pullout sofa, coffee table, desk, two armchairs, refrigerator, glass cupboard, bookshelf, and some storage space. The bedroom had a bed we thought too small for two, so I slept on the sofa. There was a hanging closet and plenty of shelf space in the bedroom. Two windows in the main cabin looked aft, and the one in the bedroom opened on the port side. The beds were made up European-style with a sheet and duvet. The bathroom was tiled, with a shower that had a pull-down seat. There was an adequate medicine cabinet. The steward cleaned the cabin once a week, when fresh bed linen and towels were provided”. Mealtimes offer an invaluable opportunity to speak with the captain and officers and listen to their maritime stories and anecdotes in an informal and relaxed atmosphere. The English spoken, as well as the food served, is colored by their nationality, which is one of the attractions of traveling by freighter. The meals, prepared fresh and served three times a day, are included in the cruise price, with complimentary wine being offered with lunch and dinner on some ships. The pantry is usually open to anyone fancying a light snack. On freighters one cannot expect food to satisfy any special dietary needs, but most chefs will prepare something else when the menu of the day is not to someone’s liking. “Meal times were at 7:30 A.M., 11:30 A.M. and 5:30 P.M., and coffee was served at 10:00 A.M. and 3:00 P.M. 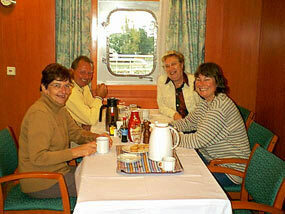 The meals are more then ample and nourishing as they are prepared for hard-working sailors. For breakfast, eggs are always available, as is some kind of breakfast meat, several kinds of bread, fruit, juice, cheese and cereal. The noon meal is the main meal of the day, and usually includes soup, meat, a starch dish, vegetables, salad and fruit. Wine may or may not be included. The evening meal is normally a ragout of some sort, often over rice, with platters of cold cuts, crudités and cheese. Serendipity played an important part in making our dining experience more enjoyable. When we first boarded, meals were adequate but completely uninspired and boring. In Hong Kong we picked up a new chef and what he could do with the same ingredients was a revelation! His garlic and broccoli soup was scrumptious, and the German officers said his konigsberger klops reminded them of home. 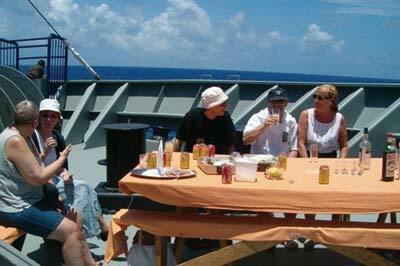 Passengers and officers shared the dining room, but sat at separate tables”. 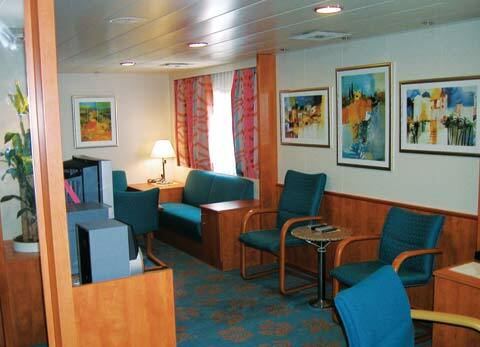 Cabin service is available on a daily or weekly basis, depending on the ship. Linen is usually changed weekly, but will be done more frequently if requested. Meals are served in the dining room only at set times and seatings may be prearranged. The dining room is usually smoke free, while the TV/Bar lounge is not. Basic toiletries and popular beverages and cigarettes may be obtained at duty free prices from a small onboard shop. Self-service bar accounts can be settled once a week or once a month, with cash in US Dollars or Euro. Self-service laundry facilities are available. Mail needs to be either stamped or paid for, and delivered to a designated officer/purser. “An important thing to keep in mind is that this is a working ship. The officers and crew were always very friendly and polite to us, but they were hired to run the ship, not to entertain passengers or act as tour guides”. 9) Who are the officers and which language is spoken onboard? English is the lingua franca of all freighters. Officers are offten European, and use their mother tongue among themselves, while crewmembers are usually Filipino, and they speak Tagalog. But when speaking to each other, or to the passengers, they all speak English. Some are fluent, others are not, but they all can answer any questions you may have. 10) What currency is used onboard? It is usually necessary to pay cash using USD for onboard expenses. Personal and traveller’s cheques are not accepted and neither are credit cards. For use ashore, take your credit card, traveller's cheques and a supply of the local currency or US Dollars with you, preferably in small denominations as vessels do not provide exchange facilities. 11) Who should I tip? Tipping is at the passenger's discretion and is limited to the cabin and dining room stewards, often one and the same person, who shares it with the chef. A good guideline is to allow for USD 3.00 - 5.00 a day per person traveling. 12) Are there elevators onboard? Not in many cases, and even when there are, the fact is not broadly advertised. Passengers who must rely on an elevator and who are not fully mobile cannot be accepted on board freighters. 13) Do freighters have telephone, e-mail and Internet connections? Yes, but these being satellite connections make the fees expensive, as high as $5 per minute. And while the Internet is not available, email (without attachments) works from the Captain's office, free of charge. Of course, there are various options for phone and Internet rental. 14) What is the electricity? Electricity is 220V/50 cycles. A two-prong round adapter and converter are needed for North American appliances. 15) Do freighters have stabilizers? Freighters run deep in the water which slows their motion in rough seas, thus serving them better than any stabilizer. Still, even in normal weather conditions, there is always a roll, a gentle one which conveys the feelings of strength and progress. 16) What clothing should I bring and what is the dress code? “As for wardrobe, take one 'very nice outfit' to wear ashore and put it in your closet immediately. Then wear all your oldest clothes. We quickly found out that we were on a working ship where the men are constantly washing, scraping, painting, and greasing cables. Unless we were willing to remain in our air-conditioned cabin, we had to cope with all this activity including smudges of whatever was being used on the ship, as well as occasional soot deposits from the smoke stack. The crew always washed the ship the day after leaving any port, but while it was being loaded and unloaded there was no way to avoid some dirt. 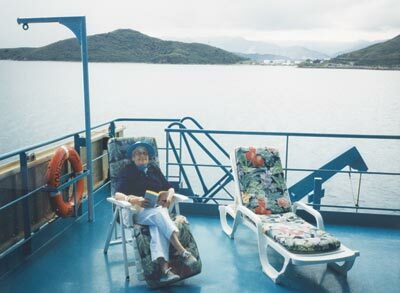 We wore boat shoes constantly since the decks are frequently wet and slippery, darker color T-shirts and cotton pants for most of the trip, and were able to donate a bundle of cleaning rags to the oilers in the engine room when we departed. That left us plenty of luggage room for the great souvenirs we picked up all over the world. The 'very nice outfit' for going ashore included pants and shirt in a lightweight silk. After a day in the hot sun you can walk into the shower carrying your silks with you, wash everything, hang them on a plastic hanger, and they're ready to wear the next day. We also brought several soft hats that either sat down well on the head or were tied on in some way as a ship running at 20 knots per hour creates its own wind. A few heavy sweaters and two pairs of lightweight wool pants took care of the cooler weather. 17) Why is the fare quoted in foreign currency? Steamship lines publish their tariffs and collect payments in their national currencies, usually Euro (EUR). Maris offers you a choice to pay in EUR currency or in US/Canadian Dollars at the prevailing exchange rate, by a bank transfer or check (credit card payments are not accepted). 18) Do I have to pay extra if the voyage takes longer? Voyages can sometimes be longer or shorter than anticipated, however there will be no extra charge for an extended period or refund for a shorter one, unless otherwise stipulated. 19) How much luggage is allowed? Approx. two suitcases - 1/2 cubic meter - 50 kilograms, per person. For more than that, please see the following question and answer. 20) Can I bring my car and other personal belongings with me? We can only book passengers. Anything beyond allowed luggage (Q&A 19) is handled by freight forwarders. They might send your bike/s in a consolidated container (packed together with other motor bikes and small cars) on any ship or steamship line. You pick it up from a terminal or warehouse on arrival at your destination. They have their own tariffs, and that cost has nothing to do with your passenger fare. Freighters are in the business of carrying freight, so the freight forwarder might be able to get your car on the same vessel you are traveling on, but you may end up paying a higher rate. Keep in mind that not all freighters offer passenger service, so you should plan to make your own reservations first. 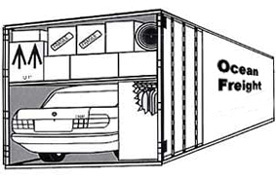 Personal belongings and family-size cars are normally transported in 20- or 40-foot closed containers, while mobile homes, due to their size, are often shipped on flat racks or in open-top containers. Transatlantic freight rates for smaller cars start at about $1,500 and motorcycles $500. Here you can access the Freight Forwarding Services Directory. 21) Can I bring my pet with me? 22) Is there an age limit? The lower/upper age limits are 14/79 on German ships and 16/76 on French ships (CMA CGM). Exceptions are made when there is a larger group of passengers (more than 12) and doctor is onboard, and on some coastal traders, such as mail and supply ships. 23) What are the visa, medical and insurance requirements? Passports must be valid at least six months beyond the anticipated return date, and foreign visas must be obtained in advance. Vaccination against yellow fever is currently required by Brazil, Mexico and when traveling through the Panama and Suez Canals.. Regardless of age, all passengers must ensure that they are fully fit to travel and have no serious medical condition. A medical questionnaire must be completed at the time of reservation, duly signed by both your physician and yourself confirming that you are able to travel on a freighter where there is not a doctor on board. And if reservation is made well in advance, the report must be reconfirmed a couple of weeks before departure. While International Health and Accident Insurance is mandatory, and its main details with benefits and claims telephone number must be provided, Trip Cancellation and Interruption Insurance is not required but is highly recommended to protect your investment against cancellation fees. Travelex Insurance packages, covering you from the moment you buy the policy, are available on our web page Before You Sail. And if you buy the Travelex policy within three weeks of your initial trip deposit, pre-existing conditions are waived. All required documents must be provided within two to three weeks before departure. 24) What services are available in port? While the Captain, officers and port agents may be able to offer some advice about shore visits, one cannot count on this. It's best to prepare yourself in advance and be well-informed about your ports of call and what you want to see. “When we arrived at a port there was no tour bus carrying thirty passengers, or a lady holding her umbrella in the air to show you the sights or guide you to souvenir shops. From the moment we walked down the gangplank, we were on our own. So again, it's a question of whether you like to be led or you like to explore on your own”. 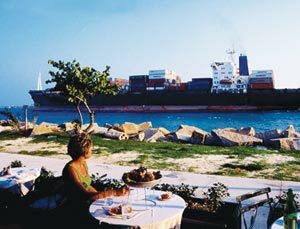 What I really like about traveling on freighters is the fact that there isn’t the pressure to participate in all kinds of organized activities or to take sightseeing tours ashore. 25) How long do the ships stay in port ...? The average port time is one day, longer for general cargo ships, less for mail ships and smaller containerships. Variations in published shedules often happen due to weather conditions, port congestion, cargo delivery, etc. 26) ... and how far from the town do they dock? Vessels dock at terminals which are often situated outside the center of a town or city, so passengers usually have to take a taxi in. 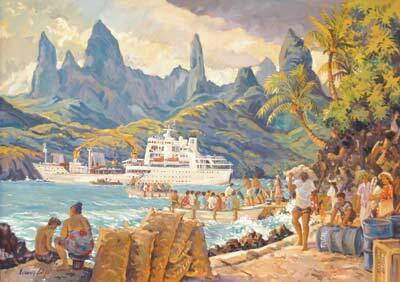 Photo below shows Papeete, Tahiti with freighters at their berths in the background. 27) How do I know when the ship will arrive and where to board the vessel? Port agent contact information is included with your ticket, which is delivered via email a few weeks before departure. Although ships are late sometimes for a day or two, but also, less likely, can arrive early, for this reason and to have some latitude in the case of your own traveling difficulties, plan to travel to or near the embarkation port a day or two ahead of time. When port agent gets in touch with the ship captain, he will instruct you where the port or terminal gate is and when to be there. Transportation within the terminal (gate to ship) is usually allowed only to authorized vehicles, which may charge for the service (cash on the spot), especially in the US ports. 28) When and how do I make my reservation? 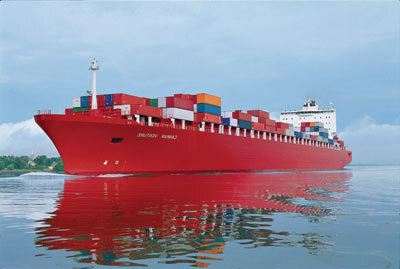 Freighter voyages can be booked anytime, from several weeks to a year or more ahead. Travelers who wish to take a particular ship, cabin and time of the year, should make reservations well in advance, or in other words - as soon as you know what you want. To help us make your trip planning and reservation procedures a pleasant experience, please familiarize yourself with this type of travel by reviewing the information on the ship, voyage, General Info. and documents required. Then please apply through our office by giving us as wide a period for your departure as you can, e.g. earliest November 10 - latest December 20, preferably around beginning of December. In consultation with the steamship line/s, we'll offer you the best option/s available. A deposit for 25% of the fare is required to secure the reservation. The balance of the fare is payable 7-10 weeks before departure. Please remember: knowing and respecting the fact that freighter schedules can vary will help put your mind at ease and enable you to better enjoy your voyage and preparations. Ports of embarkation and disembarkation, as well as the vessel and itinerary, may change for a variety of reasons including cargo requirements, holidays, weather conditions, port congestion or other factors beyond the carrier’s control. This may affect your pre- and post-freighter voyage travel arrangements. The steamship line, or its agents, are unable to make those arrangements for you. Bill MacRobbie, Carl I. Swanson, Vivienne Knapp and Bob Hartley. Mr. Hartley’s were taken from his book. “· If you are taking a trip of any length buy a map and hang it on the wall. Looking at the overall route was helpful and prompted many discussions with crew and fellow passengers. Bring double-sided tape for hanging your map as well as for a million other uses. · When I was writing, I left my cabin door open. Many of the tidbits of information in this book came through that open door. · I had little success with a short wave radio and frankly, after a few days at sea I lost interest in ‘worldly’ affairs. · Bring your digital camera. Better still, also bring a small printer. Photos of activities onboard are much appreciated. · If possible, have the ship’s stamp put in your passport. At some ports they gave us a shore pass. Where they didn’t, it was helpful when returning from town to have proof that I was a passenger on the freighter. A delightful wonderful story offering you much to learn about the ship, ports, oceans, and the world while leisurely navigating with Mr. Hartley. We have been pleased to provide you with a few lines from the 160-page book in this web page, as well as a few longer excerpts in the following pdf pages Around-the-World by Freighter -- published in 2004, the book and our newsletter, which was then still in printed form. Look for the book at amazon.com, and search for Bob Hartley. For additional information and reservations, please contact us through the Initial Request page.